My great friend, Health Coach Vicki Manuel, has put together a program to help people Spring Into Health! It’s a 30-day program that combines health coaching, goal setting and a support group. Check it out; it sounds awesome! What a beautiful day! My prayers go out to all those who were affected by the storms that embarked our presence over the past 24 – 48 hours. 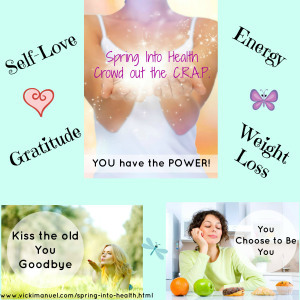 Yesterday I posted about my wonderful program that I was gifted; as a thank you for such a sweet gift I decided that I would gift one person the Spring Into Health – Crowd out the C.R.A.P. 30 day program. The rules are simple. All you need to do is listen to the preview call and you will be entered. That’s it!